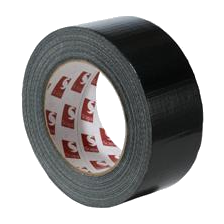 3160 is a standard grade, polyethylene laminated, waterproof cloth tape, coated with a pressure sensitive adhesive 3160 is available in black, white and silver. Designed as a general purpose waterproof cloth tape. Excellent for jointing polyethylene sheeting in asbestos removal applications. Rolls should be stored flat on their cut edges in the original packaging. The product must be protected from dust, heat, moisture, direct sunlight and solvent fumes. Service life will vary with conditions of use and is affected by climatic environment, but should not be less than two years from date of manufacture, if stored in a moderate climate and good conditions.Usage is recommended within one year.